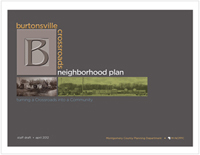 In December 2012, the County Council unanimously approved the Burtonsville Crossroads Neighborhood Plan (51.7 MB PDF). protecting the sensitive tributary headwaters of the Patuxent River. The recommendations, taken together, form a cohesive way forward and create a civic vision. View a detailed map (PDF) of the planning area. The commercial crossroads properties at MD 198 and US 29 have seen redevelopment and circulation changes that have many area local merchants, property owners and residents questioning the area’s economic future. 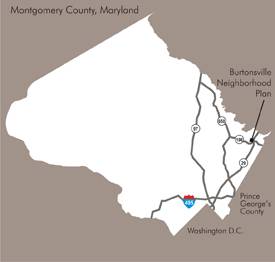 Changes that impacted the crossroads area included: a master planned loop/service road, State Highway’s MD 198 corridor planning effort, and the Base Realignment and Closure (BRAC) at Ft. Meade on MD 198 in Laurel.